Custom Vinyl Decals are one of the most common decal types. 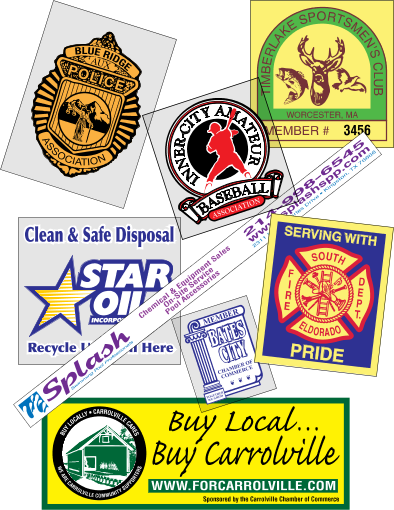 These decals are used for a variety of items: Car Decals, Manufacturing Decals, Warning Decals, Branding Decals, giveaways and more. Custom Vinyl Decals are a price effective way to get visibiltiy at a low cost. We offer decals in multiple colors and full color print. Most of our vinyl decals come with a crack and peel liner for easy application. There are 2 main types of vinyl decals: White Vinyl and Yellow Vinyl, but you can also get vinyl decals that are clear. If you need clear instead of white go to Clear Decals. Ask about our Kwik-Ship Standard Sizes & Shapes that Save you Time and Money!